Printing is the last step, and you want your pages to be easy to work from. 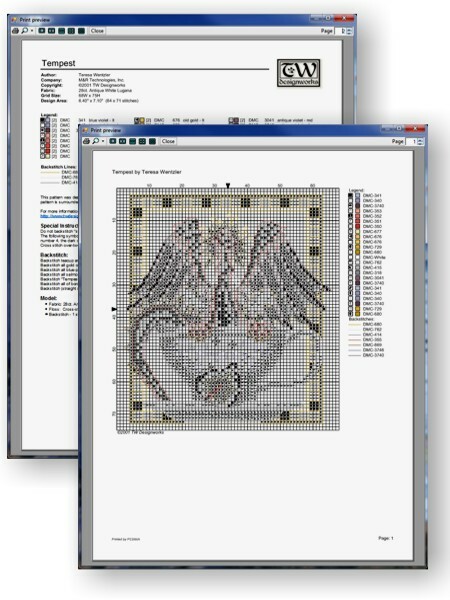 We know just how important it is to have customizable pattern pages because everyone’s tastes are different. The flexibility of PCStitch will give you everything you need to create custom printouts you will love working with! To start, you can set the zoom level of the grid to anything you like. Want to fit your pattern to a single page? Would you rather have a larger printout to work from? Regardless of your needs, PCStitch can do it for you! The symbols can be printed in black & white, or in color. We can even include the legend on the grid pages! We honestly believe our printouts are the best anywhere.